“The W.B. 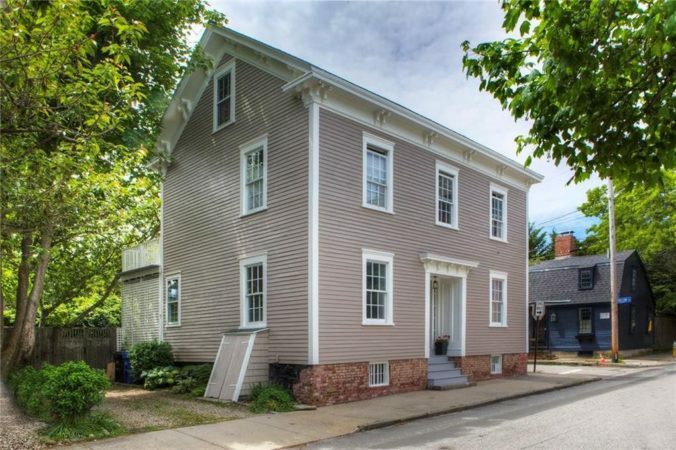 Peabody House” – circa 1860, is located in Newport’s Point neighborhood with close proximity to the harbor, restaurants, and shopping. This charming three bed, 2.5 bath residence provides a third floor guest space with additional bedroom, full bath, and office. Meticulously maintained, improvements include: young roof and windows, renovated baths, and freshly painted exterior. With a traditional floorplan, the first floor offers a family room, living room – well appointed with built-in shelves, dining room, kitchen, and breakfast room. The second level is comprised of two generous sized bedrooms, filled with natural light, second floor laundry, and full bath. The private master suite completes this floor and overlooks the fenced backyard with its own balcony porch, great for enjoying a morning coffee or evening sunset. The quaint back porch is trimmed with beautiful gardens and flowering fruit trees. A potting shed with dramatic hydrangea covering is perfect for storage, and a private terrace completes the outdoor entertaining space. Off-street parking for two. Low flood insurance.